We received a written High Performance Report by HPD Jörg Bitzigeio. There was an update on the CEO search. Most likely CoGeo - the firm hired to help with the search - will send recommendations to the CEO Selection Committee in about four weeks, which will then do its own evaluation, which could take up to another six weeks. So most likely the board will be voting on the hiring of a new CEO around late April. I led a long discussion on the USATT Board Code of Conduct. There are some silly things in it, as I explained. For example, it requires board members to "support" all decisions by the board, whether they voted for them or not. The problem is that "support" has many meanings. Using Webster's, the board could "weaponize" this by insisting it meant that board members had to "defend as right" and "argue for" decisions they don't agree with. Or, as I also pointed out, we could define it as meaning "to uphold or defend as valid," which is a bit more reasonable. As I pointed out, with the current wording, if a board member is asked his opinion on a decision he disagrees with, he has to lie and say that he believes the decision is right and argue for it, or he could be found in violation of the Code of Conduct! So I proposed changing board members will "Respect and support the decisions of the board" to "Respect and uphold…" Ed Hogshead disagreed, arguing that outside of meetings, the board should speak with one voice. (He and I have a fundamental disagreement here.) I also proposed a change to the part where it says that board members shall not "be critical, in or outside of a board meeting, of other board members or their opinions." I want to take off "or their opinions." There were a few other similar items I wanted changed. However, while it looks like the board will overwhelmingly approve these changes, there were some disagreements on language. So this was set aside, and board members were directed to email their recommendations to me, board chair Anne Cribbs, and USATT attorney Dennis Taylor. (So far none have been received.) I discussed this issue at greater length in my January 14 blog, in the segment on the teleconference. We received a short report on the status of a proposed General Membership Code of Conduct. There was a long discussion about a proposed "Understanding between USATT - ITTF North America and TT Canada." Tony Kiesehofer, ITTF regional director for North America, was on the call to take questions. In simple terms, the ITTF hopes to run more events in North America. We had an executive session to discuss personnel/legal issues. I can't believe that XXXXX did XXXXX to XXXXX!!! Wow!!! :) See, if you were on the board you'd get to know all about this! We discussed a proposal to change the USATT mission statement to match the new one listed in the new USATT Strategic Priorities. Surprisingly, most of the discussion here and previously (via email and our last teleconference) was over whether to use a comma or semicolon at one part. Yeah, this was, IMHO, a Dilbert moment. It didn't affect the meaning, just the emphasis, in the opinion of some, though I don't agree. I stayed out of the discussion, though previously when asked I said it didn't matter. We voted to approve the new mission statement, with the "comma" version. So, are you on Team Comma or Team Semicolon? (Or maybe Team Previous?) You decide - here are the two"versions"; I'll let you find the change. "The Mission of USATT is to support, develop, grow, and inspire the table tennis community; and to provide resources that enable athletes to achieve sustained competitive excellence and pursue Olympic and Paralympic success." There was a proposal by the Ethics and Grievance Committee to make several changes the bylaws to protect USATT from obvious nuisance grievances. Few people realize that USATT board and staff spent more time over about one year on one single person than the other 8000 members combined - because this person discovered that he could use loopholes to force USATT to address every single one of about 100 nuisance "grievances" he filed. He lost on every single case, but I personally spent over 110 hours on this issue, and others spent even more. (It was one of a number of reasons I decided not to run for re-election.) It was one of the biggest wastes of USATT time and resources in modern history. I was one of the ones who asked the EGC to look into fixing this problem, and I am grateful that they have done so. I agreed with all of the proposals, but several board members still had questions on some aspects and others hadn't had time to review them, and so it was tabled until next meeting. As to the changes themselves, there were several, but one in particular was a simple solution: it allowed the EGC, in consultation with the USATT attorney, to judge whether a complaint has merit rather than being forced to go through a formal hearing, etc., that forces the accused parties to spend huge amounts of time and money on their defense. A nuisance grievance may seem like something you can ignore, but if you don't defend against even baseless accusations, you could lose and you don't get a second chance. There was a short discussion of the problem of match dumping, but that'll be taken up again at a future meeting, with possible recommendations from the tournament committee. We had a written Foundation and Fundraising report from Carl Danner. Chief Operating Officer Mark Thompson gave a US Nationals update. Entry form was delayed as they are trying to add some new events, such as mini-cadet teams, which I hope they can fit in. (It'll likely be out next week.) The official hotel will be the Renaissance Hotel. The tournament is July 1-6 in Las Vegas. There was discussion of the upcoming USATT board meeting, March 29-31 at the ICC club in California. This will likely be the first meeting with someone taking my place on the board. Here's the ITTF home page for the event taking place now through this weekend in Lisboa, Portugal. Rather than redundantly link to every one of their main news items, here are their news pages. I've linked directly in segments below to many of the most interesting ones. 4-year-old Training (2:50) - Winnie Pong? Here's the video (5 sec) - a loop against backspin, a loop against block, and then a smash. Here's the video (13:57) of the Belgium player, from Arnaud Scheen. Here's the video (6 min). Here's the USATT article featuring Homer Brown, by Richard Finn. In December Homer competed in his 50th consecutive U.S. Open. (I'm chasing him - I've been to every Open and Nationals since 1984 - 35 in row for both - and every North American Teams (previously called the U.S. Open Teams) since 1976 - 43 in a row. Here's the article on USATT Chief Operating Officer Mark Thompson as he is inducted into the Reading Royals (hockey team) Wall of Honor. Here's the article on this New Jersey club, by Steve Hopkins. Here is Chapter Eight of Tim Boggan's History of U.S. Table Tennis, subtitled "Reader's Views." Or you can buy it and previous (and future) volumes at www.timboggantabletennis.com. Volume 22 is 469 pages with 1447 graphics, and covers all the wild things that happened in 1996-97 - and I'm mentioned a lot! Why not buy a copy - or the entire set at a discount? Tim sells them directly, so when you order them, you get it autographed - order your copy now! Let's Get More Females Playing Table Tennis! Here's the USATT video (2:15), featuring Lily Zhang and Wu Yue. 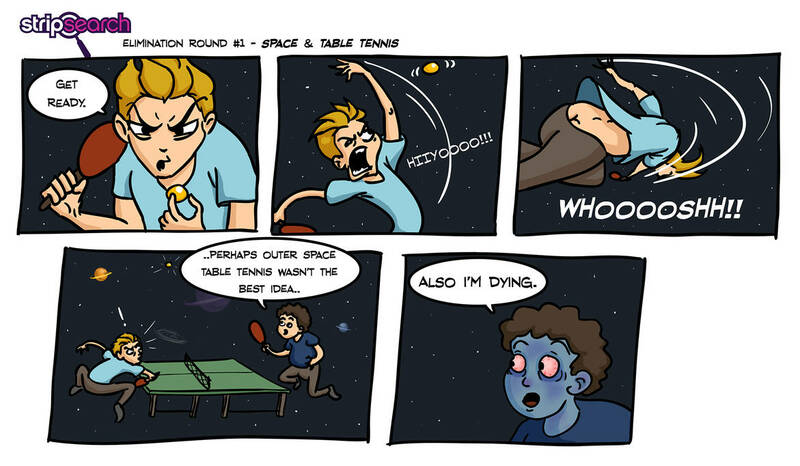 Table Tennis - "Never Give Up!" Here's the video (5:12) from Pong Universe. Here's the video (2:45) featuring Adam Bobrow. It's pretty hilarious - why don't more players use this shot? My guess is it'd be pretty effective up to perhaps the 2000 level, and sometimes beyond that! You should be able to read the bounce of the ball by the way it's spinning in the air toward you, but since you are not used to seeing this shot, few players can react correctly. Strong players who are nimble on their feet and don't react prematurely can adjust at the last second after seeing the bounce - but it's tricky! Here's the video (14 min) - I'm not sure what's going on as it's in German, but it has Timo Boll, and involves "around the table" play and some sort of challenge match. Presumably Müller and Hummels are some sort of celebrities? Comment below if you have any idea of what's going on. Here's the cartoon video (31:52, with the first 3.5 minutes featuring table tennis)!